President of the Centre for Pakistan and Gulf Studies Senator Sehar Kamran (T.I.) attended the Seminar organised by the Muslim Institute on the topic of “Palestine Conflict: Obliteration of Human Rights” on August 22, 2014. She spoke on the on-going Palestinian conflict, Muslim Ummah’s role and the criminal silence maintained by the international community. She highlighted the high number of civilian causalities including women and children who have directly targeted by the Israeli forces. She highlighted the 1974 OIC Summit in Lahore and how the Muslim leadership of that time was removed one by one after the success of that Summit which was organized by Shaheed Zulfiqar Ali Bhutto. She emphasized that the Muslim Ummah today needs a strong, visionary leadership. 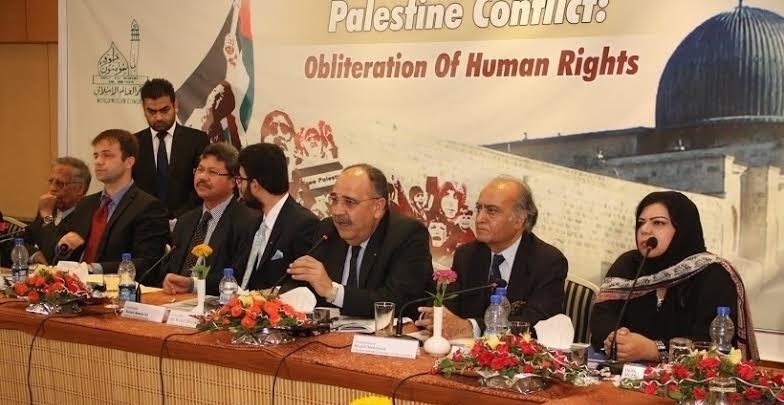 Moreover, Senator Sehar Kamran termed the international community as nothing more than “deaf, dumb and blind” regarding their role in stopping the Israeli aggression on Gaza. She said her heart is bleeding for the innocent war-torn Palestinians. She said as Muslims we have stopped following the Quran and have become slaves to these Western powers, adding that the Muslims today exist in a large number, have humongous resources but still are unable to take a united stand. She reiterated that it was time for the Muslim community to wake up and act. Senator Kamran further appreciated the role of Pakistan army and its involvement in Operation Zarb-e-Azb. She said as a nation we must remember what the founder of the nation, Quaid-e-Azam Muhammad Ali Jinnah had said about standing united, because if we stand united, the voice of the Muslims will be heard more effectively and everywhere.